We don't eat a whole lot of red meat in our house. When we do, it is usually a lean cut like filet mignon. Because filet doesn't have a ton of flavor on its own, this chimichurri sauce adds the perfect amount of punch to this perfectly textured, tender cut of beef. This is a great entertaining recipe because the majority of the work is done ahead of time. It takes about 45 minutes to roast the garlic but other than turning on the oven, there is no work involved. Just toss everything in a magic bullet or blender and it's done!I make the chimichurri the night before and leave it in the fridge. The next day, the steaks take about 12 minutes to grill. I take the sauce out of the fridge and let it come to room temperature while the steaks cook. Cut the top 1/4 off of the garlic, wrap loosely in foil and bake for 45 minutes. Cool. Combine remaining ingredients in the magic bullet or blender and blend until parsley and peppers are finely chopped. Season with salt and pepper. Drizzle with Chimichurri before serving! I love so many of The Barefoot Contessa's recipes. This particular dish tastes like summer on a plate to me. The original recipe uses split chicken breasts with the skin on which of course works well too. On this particular day I used chicken tenderloins because that was what I had mistakenly ordered from peapod. I usually make it with boneless skinless chicken breasts because that is what we prefer. I marinate about 2 pounds of chicken and use the leftovers to toss in our salads during lunch. It takes about 15 minutes to make and clean up the marinade the night before and another 15-20 minutes to grill it the next day! Quick and easy! Heat up the grill and brush the rack with oil to prevent the chicken from sticking. Remove the chicken breasts from the marinade, sprinkle well with salt and pepper, and grill them for a few minutes, (or more) depending on the thickness. Turn the chicken and cook for another few minutes ( or more), until just cooked through. Remove from the grill to a plate. Cover tightly and allow to rest for 5 minutes. Serve hot or at room temperature. *I mix mine in a large ziploc bag. Be careful if you do this. There is quite a bit of liquid. It gets difficult to hold the bag and add ingredients without spilling! I realize breakfast is the most important meal of the day but I am just not hungry when I wake up. I drink some coffee and then need to eat an hour later. Of course I have already made breakfast and cleaned it up at this point and the thought of going through the process again is less than appealing. I own one of those magic bullet blenders and decided to experiment with some smoothie recipes that would keep me full and require little clean up. This one is my favorite. It has about 9 grams of protein and 5 grams of fiber. A healthy and filling breakfast that gets me through the morning! As soon as the girls saw me drinking a frothy, milk shake looking breakfast, they immediately wanted to taste it! They LOVE it. The recipe below makes one shake and fits perfectly in the magic bullet. If I am tripling the recipe for the girls, I need to bust out the big blender! Blend all ingredients in a magic bullet or blender! Serve cold!!! * I like to add 2 T of raw sunflower seeds to mine. The girls don't like it because it adds a "bitty" texture. Pulled pork is one of those great set it and forget type slow cooker recipes. The longer it cooks, the better it tastes. Our middle daughter, Talia, was born with severe food allergies. I quickly got into the habit of compulsively reading food labels and carefully reviewing ingredients. Everyone loves barbecue sauce in our house but finding a brand that was safe for Talia and did not contain yucky ingredients like high fructose corn syrup, was extremely difficult. I now make my own barbecue sauce and have included the recipe below. It tastes just like the Sweet Baby Rays brand, which I use if I am pressed for time. Because the pork recipe is so low maintenance, I love to use my bread machine to make the dough for these onion rolls. When the dough is done, knead it a couple of times on the counter, let the rolls sit for a little bit and bake them. This is a great dish to serve on a summer weekend when hosting a little backyard BBQ. There is so little work involved you can actually visit with your guests and not be hanging out in the kitchen or sweating in front of the grill. Serve with some salads and you're good to go! Place pork in slow cooker. Pour beef broth over it. Remove pork from slow cooker and shred. Pour desired amount of bbq sauce on the shredded pork, stirring to combine. The ingredient list is long but most are kitchen staples! In a large saucepan over medium heat, mix together the ketchup, tomato sauce, brown sugar, wine vinegar, molasses, liquid smoke and butter. Season with garlic powder, onion powder, chili powder, paprika, celery seed, cinnamon, cayenne, salt and pepper. Bring to a boil. Reduce heat to low, and simmer for up to 20 minutes. For thicker sauce, simmer longer, and for thinner, less time is needed. Sauce can also be thinned using a bit of water if necessary. Place the water, butter, salt, sugar, onion powder, 3 tablespoons of dried onion, oats, flour and yeast into the pan of a bread machine in the order recommended by the manufacturer. Select the Dough cycle, and press Start. When the cycle has completed, remove the dough from the machine, and knead on a lightly floured surface for about a minute. Cut into 8 equal pieces, and form into balls. Place on a baking sheet, and cover loosely with a towel. Let rise about 40 minutes (they will double in size). Preheat the oven to 350 degrees . Whisk together the egg white and water in a cup. Brush over the tops of the risen rolls, and sprinkle with remaining minced onion. Bake for 15 to 20 minutes in the preheated oven, until golden brown. Cool completely, then slice in half horizontally before using. Oh how I love strawberry season! In our house it is the official start of summer. I wasn't going to post the jam recipe I use because it's right inside the Sure Jell box you can buy at your local market! In the past two weeks, I have given it out 6 times so I decided it was worth posting! 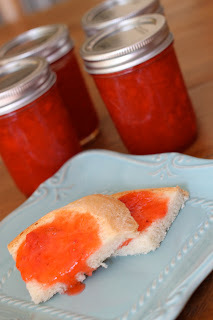 This recipe is for freezer jar jam. Many consider this to be a baby step toward canning. In making freezer jam, you follow the same process as you would in traditional canning, minus the heat. This saves time and a little bit of effort! Don't feel like you are cheating though! In my opinion, uncooked fruit stays much fresher than cooked preserves, so when you crack open your strawberry treasure in mid-January, it will taste more like the fresh summer fruit you picked from the field. This jam is the ultimate in prep ahead recipes. I'm not claiming it's low in calories and super healthy because it's not. My kids run around like maniacs all day so a little bit of sugar is perfectly fine with me in their otherwise healthy well-balanced diet! I always double this recipe and get about 12, 8 oz jars out of it. There is nothing better than opening a fresh, homemade jar of strawberry jam on a frigid winter morning. A little taste of summer in those cold winter months is the best! This recipe is so quick and easy, we made it before Riley headed off to school the other day! After we came back from the bus stop I threw all of the ingredients in the bread machine and we had jam and bread for snack that afternoon. Yum! But who needs bread? I could drink this stuff. Place all ingredients in the bread machine pan in the order given. Set on french setting and medium crust. 2 cups crushed strawberries (buy 1 qt. fully ripe strawberries) I use a potato masher. Be sure to measure the crushed fruit ! I use 8 0z glass ball jars. I wash them in the dishwasher first. When filling them with jam, I leave about an inch at the top of the jar for expansion. I always double the recipe from above and get about 12 jars out of it. Stem and crush strawberries thoroughly, 1 cup at a time. I use a potato masher. Measure exactly 2 cups prepared fruit into large bowl. Stir in sugar. Let stand 10 min., stirring occasionally. FILL all containers immediately to within 1/2 inch of tops. Wipe off top edges of containers; immediately cover with lids. Let stand at room temperature 24 hours. Jam is now ready to use. Don't be afraid to spread some on a piece of bread immediately. It will be a little runny as in my picture but still yummy! Store in refrigerator up to 3 weeks or in freezer up to 1 year. Thaw in refrigerator before using. Copyright © PrepAhead and Dine In: June 2010. All Rights Reserved.